Often circumstances out of a young person’s control can leave them without a safe place to call home. The 2016 Census highlighted the difficulty in confirming numbers of youth, aged 12-24, who are experiencing homelessness. Young people who may have been ‘couch-surfing’ at a friend’s house provided a home address on Census night, even though they may not be permanently living there. When it comes to ‘couch-surfing’, often the host family aren’t even aware that the young person is unable to go home. On any given night in Australia 116,427 Australians are homeless. 27,680 of these are young people aged 12-24 years. Most of the homeless youth aged 12–18 years in 2016 were living in 'severely' crowded dwellings (61%) or in supported accommodation for the homeless (26%). More generally, in 2016, 59% of homeless youth aged 12–24 years were living in 'severely' crowded dwellings and 18% were in supported accommodation. 9% of homeless persons aged 12–24 years were living in boarding houses, and 10% were staying temporarily with other households. Youth aged 12–24 years made up 32% of total homeless persons living in 'severely' crowded dwellings, 23% of persons in supported accommodation and 15% of persons living in boarding houses in 2016. The proportion of persons classified as homeless who are aged 12–24 years is consistent across the States and Territories. Often young people don’t know where to go for help or how to find the resources they need. Even to apply for a Youth Allowance can be a confusing process and many give up. Lack of support and connection to people often limits a young person’s options. Youth that leave out of home care (OOHC) at age 18 are often not prepared to be independent adults. As a result they can face unemployment, homelessness, and mental and physical health issues. The Salvation Army formulated a comprehensive response to the National Youth Commission Inquiry into Youth Homelessness. The report entitled Finding my place details seventy-four recommendations on how to address youth homelessness in Australia. 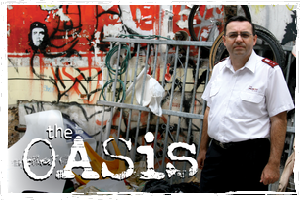 Alongside the inquiry, a major feature documentary, The Oasis, was made by the documentary production company Shark Island Productions. Young people from one of our homeless youth centres in Sydney participated in the film for over two years, courageously sharing their life experiences. "To prevent more young people becoming homeless, we need to find lasting solutions, based on what works. This is not just a social concern, but also an economic one. When you are homeless, it's almost impossible to hold down a job or acquire new skills. 20,000 homeless youth means 20,000 pre-skilled workers going to waste. Can Australia really afford that?" Major David Eldridge.